By default, the two categories are Small Group (for Groups Trees) and Team (for Sports), as shown below. •ID – This is the ID value for the Category that Arena automatically assigns. •Category Name – This is the name of the category. •Cluster Types – This number represents the number of cluster types within the category. •Groups – This number represents the number of Small Groups. •Cluster Types – Click the Cluster Type link to display all the Cluster Types in this category. 1. Click the Edit Category icon to display the Category details. 2. Customize fields, as needed. •Name – This is the name of the Category and the tab name for the Small Group level for all Cluster Types in this category. Arena automatically makes this word plural. •Group Page ID – Click the Search icon to select the group details page. •Cluster Page ID – Click the Search icon to select the cluster details page. •Default Role – Click the drop-down list to select the default member role assigned to people when users add people directly to any group in this Category. •Use Uniform Number – Select this box to use uniform numbers for group members within this Category such as for Sport groups. •Use Area – Select this box to include an Area field to set the Area of a Group. •Allow Bulk Updates – Select this box to allow users to Bulk Update from a Groups page. •Private History – Select this box if the desire is not display group information in the History section of the Person Details page. If you select this box, the group history displays on the group leader’s history information. •Credit as Small Group – Select this box if all groups in this category should display in Map Area Statistics. 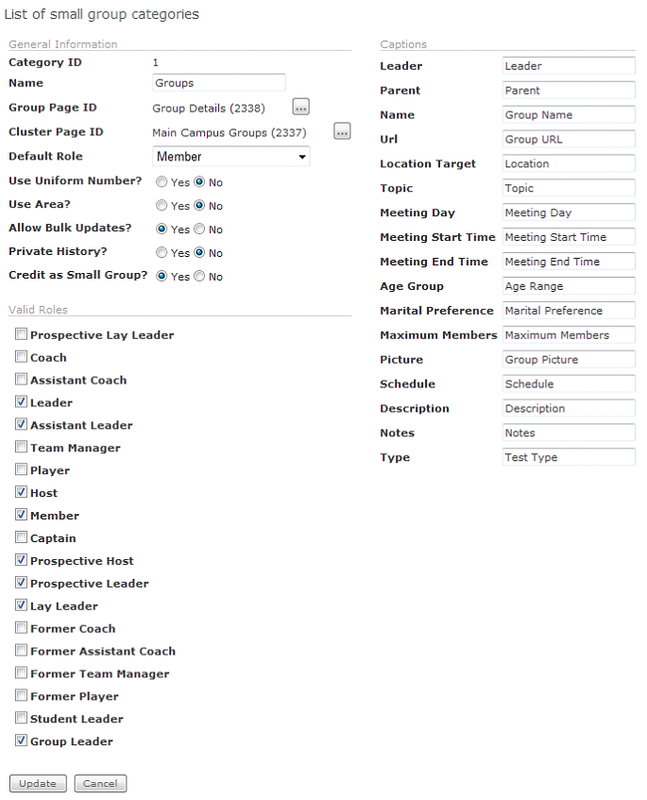 •Valid Roles – Select the valid roles for all groups in this category, determined by the Small Group Roles Lookup. •Captions – Set the caption text to display for the fields used in Group Details. These fields are determined by correlating Lookups. If you enter no caption, the field does not display in Group Details for this Category. 4. Once you setup the Category, click the Cluster Types link to create or edit Cluster Types for this Category. 1. Click the Add New Cluster Type icon to add a new cluster type. •ID – This is the Arena assigned Cluster Type ID. •Name – This is the name of the Cluster Type. •Allow Occurrences – If checked, attendance is available for the groups in the cluster type. •Allow Registrations – If checked, people can register for the groups in the cluster type. •Region Name Lvl – This is the level used with regions. •Unassigned Registration Lvl – This is the group level where Arena places unassigned group registrants. •Total Groups – The total number of groups using this cluster type. •Total Levels – This is the total number of levels for this cluster type. •Total Clusters – This is the total number of clusters for this cluster type. 2. Complete fields, as desired. •Cluster Type ID- This is the ID number Arena automatically assigns for the cluster type. •Name – Enter the name for cluster type. •Region Name Level – Arena assigns a region level. You can modify, as needed. •Unassigned Registration Level – Enter the (cluster) level for unassigned registrants when users enter them from Add Registrations page or from your Arena-managed website. •Allow Registrations – Select this box to allow registrations for this Cluster Type. •Allow Occurrences – Select this box to enable taking attendance. When creating cluster levels, keep in mind the number of levels determines the depth of the Group Tree. 1. Click the Cluster Levels link of the Cluster Type you would like to add a Cluster Level. 2. Click the Add Cluster Level link. You need to add levels in order, starting with Level “0.” The more levels you add to a Cluster Type, the more levels a Group Tree contains, before displaying the small group. Because of this, it is a good idea to have a layout in mind for small groups before creating cluster types and levels. •Name – Enter the name of the Cluster level. •Level – This is the pre-determined cluster level. •Allow Groups – Select this option to allow Groups. Only the last (bottom) cluster level should allow Groups. •Allow Area – Select this option to allow Areas for Group Clusters, typically the last level. This is typically set at the last cluster level, where the Groups exist. •Notify Leader – Select Yes for Cluster Leaders to receive an email when someone registers for the group. •Notify Admin – Select Yes for Cluster Admins to receive an email when someone registers for the group. 5. Repeat steps 2 through 4 until you create the desired number of cluster levels. 6. Once complete, you are ready to create Groups. Before you can delete a cluster level, you first need to delete all groups associated with the cluster level. 1. The cluster type page displays this number in the Total Groups column on the cluster type page. 3. Now you can click the Cluster Level Delete icon. 4. Once you delete all Cluster Levels, you can delete the Cluster Type, if desired.